Eco-De-Rust Ph7 is the latest technology in rust removal. No longer are strong acids or alkaline chemicals required to remove rust. Eco-De-Rust Ph7 is organic based ,non-toxic, non-corrosive, biodegradable and will remove deep rust from mild steel and iron. This product is now only available in 25 litre drums and can only be delivered on HAZMAT courier services. Eco-De-Rust Ph7 is safe for use on all surfaces and will not harm copper, brass, aluminium and most other types of metal allowing multi-metal components to be processed such as steel/aluminium without risk of attack. Eco-De-Rust pH7 will remove a deep rust from various automotive components. *Excellent for removal of rust from a wide range engine components including cylinder heads, turbo housings etc. 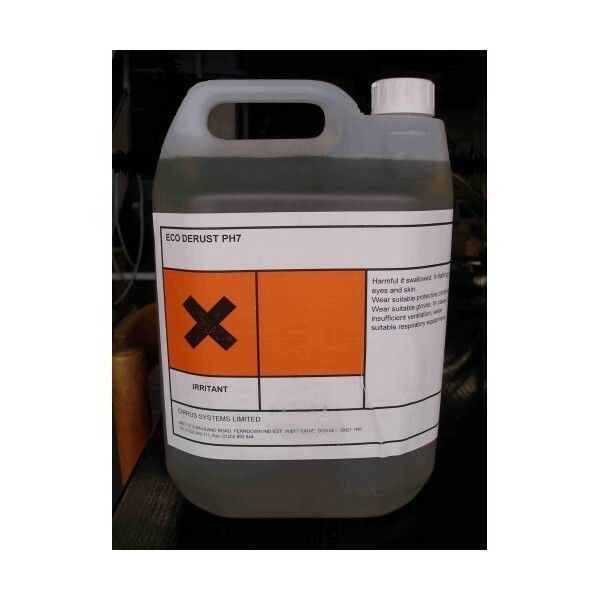 *Eco-De-Rust pH7 is formulated for use in immersion, immersion agitation or ultrasonic systems.